Tropicana Field home of the Tampa Bay Rays in its minimal glory.I joined the Saint Petersburg Chamber of Commerce in June of this year. At the Chamber's new member orientation networking event they have a raffle where everyone puts their business card in for a prize drawing. The top prize was a pair of tickets to the Rays game that evening. They were playing the Toronto Blue Jays. I knew I had won before the woman even read the name because of my business card's distinct color. I was half stoked and half thinking, do I have time to suddenly go to a baseball game? 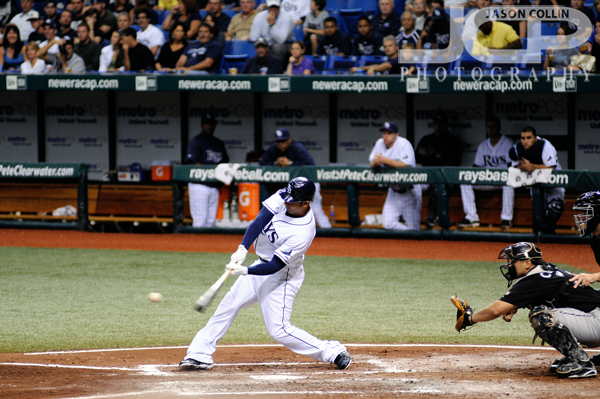 A Tampa Bay Ray at bat against the Toronto Blue Jays in Tropicana Field. I had heard that Tropicana Field was not a great baseball venue at all. My first impression walking from the parking lot to the entrance gate was very positive. Once inside I felt, "this isn't so bad. The atmosphere is pretty good, lots of booths and different stuff going on. Decent buzz." Lenses inside Tropicana Field have to be less than 12 inches long, not a problem from my 3rd row behind the dugout seat. The Chamber has great seats, just three rows behind the visitor's dugout (along the third base line). We were the first ones in our row and in the area, so had clean site lines and I was able to get unobstructed shots. However, people filed in well after the first inning and it made getting any good shots nearly impossible. 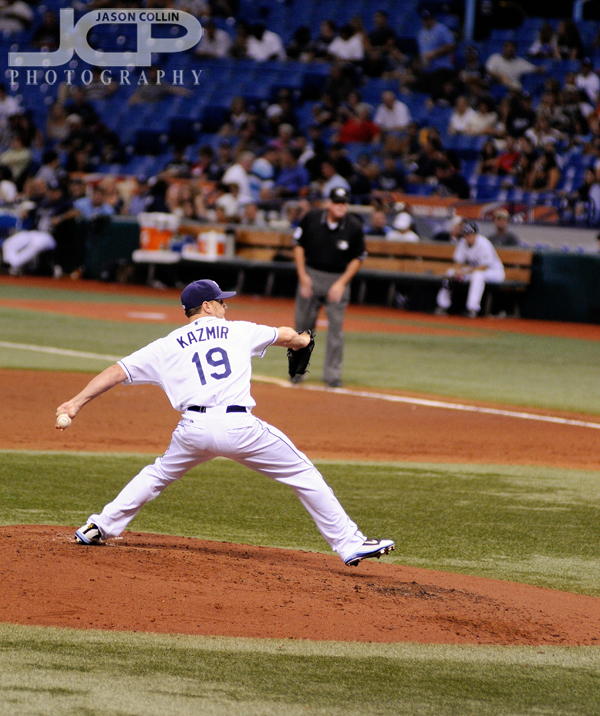 Scott Kamir was soon traded from the Rays to the Angels after this start. I started to notice that Tropicana Field was actually not that nice of a baseball stadium at all. There were lots of dark areas at the top of the dome, very poorly lit. The neon and regular billboards overwhelmed the outfield view. 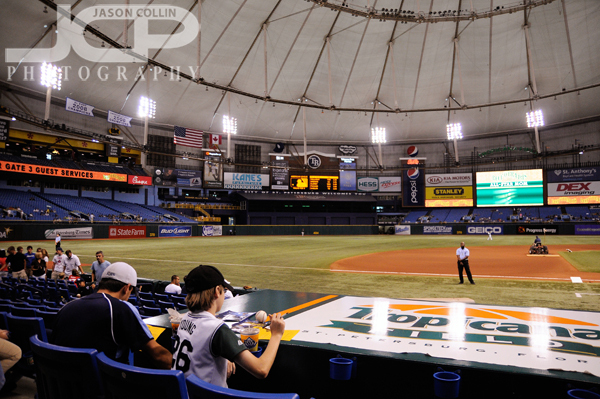 It soon felt very dreary inside the dome, despite the cheers of the Rays faithful. 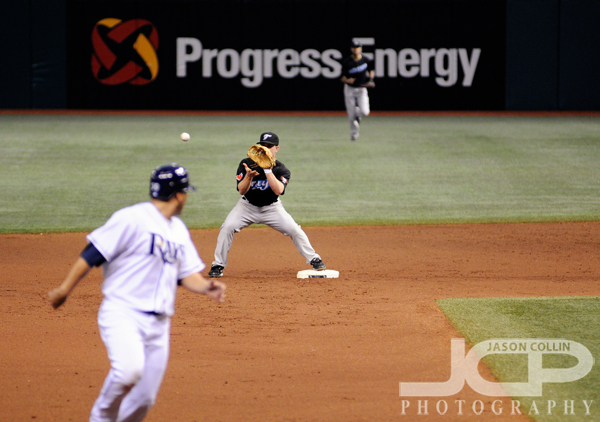 People scramble to catch a home run ball in Tropicana Field.Still, as home runs started to be hit I felt excited. I must confess also this was the very first major league game I attended. 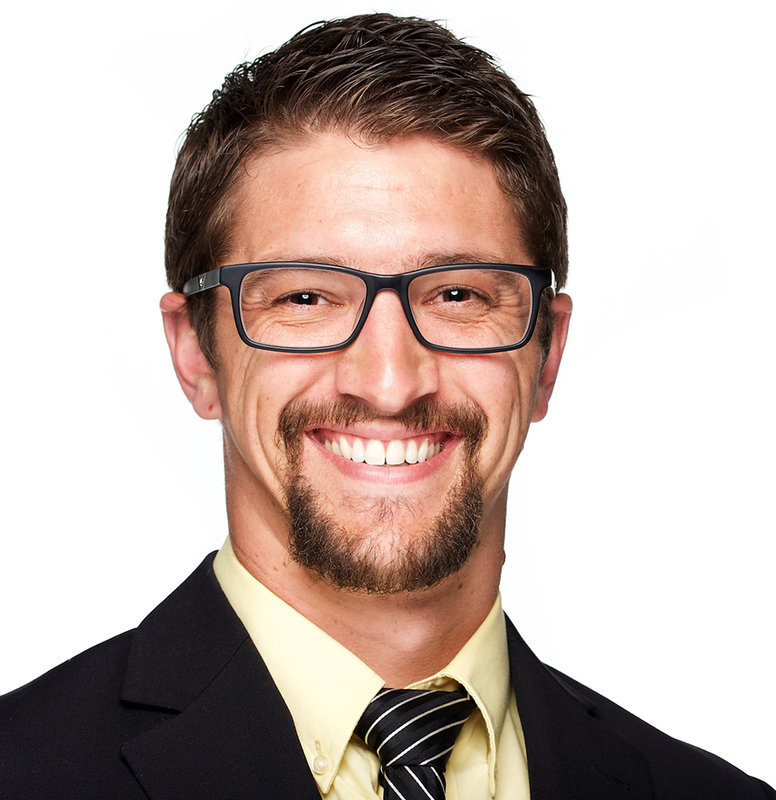 I can make the claim to fame, however, of seeing Michael Jordan plan a spring training game years ago.